Penn State student Shams Alyahya from Saudi Arabia stands in front of a "You are Welcome Here” banner that features her picture. The banners were hung to make international students feel welcome in the community. When Shams Alyahya decided to come to Penn State to study from Saudia Arabia, she said her parents were a little concerned. Besides the typical worries about their daughter traveling across the world, Alyahya said her parents were concerned that she may not be very welcome in America with the current political climate. Alyahya and other international students are shown on the banners, which were a collaboration between State College Borough and the Penn State University Park Undergraduate Association. They were designed to encourage diversity and make international students feel welcome in town, said borough communication specialist Douglas Shonts. Many of the 90 banners were hung before an April 2 ceremony at the State College Municipal Building that was attended by many of the students who were featured on the banners. State College Mayor Don Hahn thought back to his parents, who were Korean immigrants, when saying how important it is to welcome international students to the community. Hahn said State College is committed to making people feel welcome in the community and embraces those of different backgrounds. “Our destiny is not to hide behind a wall to feel safe. Our destiny is to build a better world together, to be a part of that world and share that world with others,” said Hahn. Other international students featured on the banners include: Shreyash Manak Bohara, of India; Isabel Bejarano Diez, of Colombia; Qifeng Liu, of China; Harmonie K. Ngamuyeka, of Democratic Republic of the Congo; and Charles Drury, of Sweden. The banners will be up until the end of summer, if not longer, said Shonts. The students said they were glad to be a part of the process and got a kick out of seeing their pictures hanging downtown. “I screamed when I first saw it," said Bohara. Drury said he received a lot of Instagram likes when he posted his photo online. 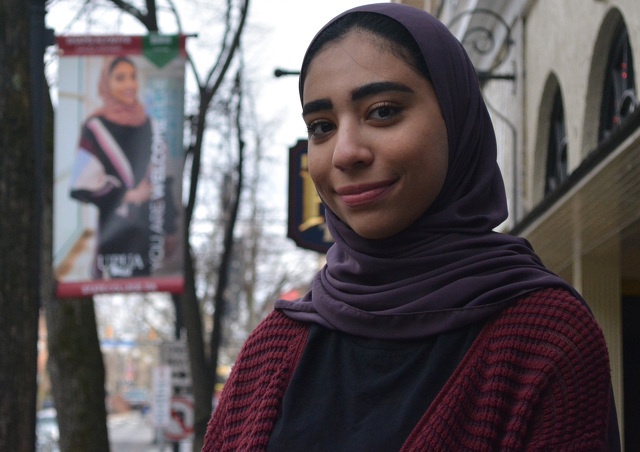 Both students agreed they hope their pictures on banners can make people feel more welcome in State College, which is something Alyahya thinks will happen when people walk by them.